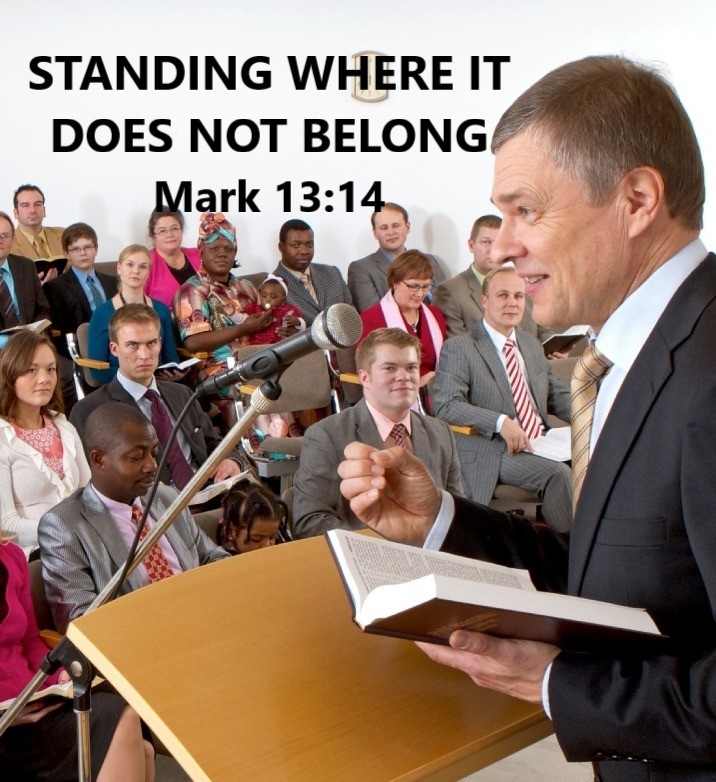 "STANDING WHERE IT DOES NOT BELONG"
Re-posting this with additions, on the identity of the Man of Lawlessness. I can’t seem to find my previous post that was made under the past label “Controversial” a long while back. Imagine a large room, where genuine anointed ones from the organization have gathered together. I say “genuine” because it is becoming a discreet trend for many to partake during the memorial, who are not anointed. In my mind, I see this as another attempt by Satan to seduce individuals into thinking that all are part of the anointed Body of Christ, under the New Covenant; and which is another step, in concealing who are the “holy ones”. How can we relate this scripture to the elder body having authority over the anointed priesthood in the organization? Rev 11:1,2, shows “Gentiles” overtaking the sanctuary/"holy place" of God, and robbing the anointed priesthood of their ‘holy garments’; thus desolating this spiritual sanctuary.
) so that all sheep may know and revere God accurately. ), that allows the entrance of the counterfeit Gentile priesthood of elders into the sanctuary to serve as priests. The last powerful and “unusual” force of Daniel’s image expresses two contrasting elements – one of clay and one of iron, found together. The entirety of this image describes powers that have affected God’s people during their individual historic reigns, but please consider Pearl’s comment on the last power and fourth beast that the anointed ones face today in the Watchtower organization. “The feet of the image shows that the reign over the anointed in the time of the end, is dual. This has come to pass, in that the anointed today are dominated within the Organization, not only by spiritual "Gentiles" alone; but by their own brothers who have joined in with the Gentiles to dominate their brothers in Christ....the wicked steward with "confirmed drunkards" from outside the master's household (Matt.24:45,48-51). An early Watchtower magazine compares JWs with the Nethinim and Gibeonites who have united together to support the anointed remnant. WT 63/7/1 p. 416: The antitypical Nethinim and Gibeonites have associated with the priestly remnant in worshiping Jehovah alone as God, willingly becoming temple assistants in support of the remnant of “living stones” of the spiritual temple. However, after King Cyrus issued the decree that captive Israel was to return home from Babylon, there was opposition that the people faced once the new temple foundation had been laid. A resettled people, enemies with the intention of obstructing the completion of the temple, deceitfully presented their help in the building process. The Samaritans had taken up residence in the land when God’s people entered captivity, and were the prime threat in rebuilding the temple in Ezra’s day. From the northern tribes after the split of Israel, they claimed to be descendants of Ephraim and Manasseh; even of the Levite tribe; yet, at that time period, they were bitter enemies of the southern Kingdom of Judah. The persuasion is so convincing that the anointed willingly hand over their royal “robes”, their identity as God’s priests, to the Man of Lawlessness, the elder body. that his neighbors should be his adversaries. This is such a pathetic, narrow-minded, microscopic and miniscule application of a prophecy that has a global relevance. What a waste of spirtual space if this is all Jehovah had in mind in prompting Paul to prophesy in such a manner! @The Witness / Pearl Doxsey - Why don't you just create your own club on here and preach your own version of Christianity? I get that you are relating many items back to JW's but you could do better in your own club rather than challenging every JW on here. 'You get more flies with honey" sort of thing....? “Concerning the coming of our Lord Jesus Christ and our being gathered to him, we ask you, brothers and sisters, 2 not to become easily unsettled or alarmed by the teaching allegedly from us—whether by a prophecy or by word of mouth or by letter—asserting that the day of the Lord has already come. Don’t your wayward anointed leaders (“as if from us”) preach that God’s Kingdom ruled by Christ was born in heaven in 1914? That the “day of the Lord” has come? 3 Don’t let anyone deceive you in any way, for that day will not come until the rebellion occurs and the man of lawlessnessis revealed, the man doomed to destruction. 4 He will oppose and will exalt himself over everything that is called God or is worshiped, so that he sets himself up in God’s temple, proclaiming himself to be God." What is God’s Temple to you? 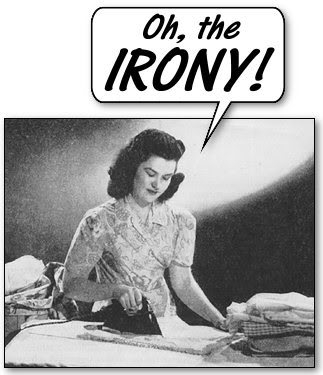 All of JWs, as I have heard Samuel Herd comment? (He, of all people should know the true meaning of God's Temple) Is it Warwick? The organization? Or, is it found in Christendom? Who has the authority to cast out God’s Temple priests? The same elder body that approved of an idol in Watchtower’s House of God. Yes, it is the elder body that claims the same exemption as Christendom for clergy confidentiality in their lawsuits; yet, at the same time also claiming NOT to be priests/clergy. You and all JWs have been hoodwinked. In the first fulfillment of Matt 24:15, Jerusalem was destroyed by the Roman army. Who make up “New Jerusalem” today? And you believe that God will not be bothered by this? You believe that His “special possession” that once sealed in the heavens, ushers in the Kingdom...you believe they are minutia? I back up what I say with scriptures. Can you do the same? Just to remind you, I have never preached “me”, unlike your self-assumed “faithful and discreet slave”, who preach themselves as fully equipped to judge in “righteousness”. I address the grave situation with the anointed Body of Christ, Temple, “living stones” of God’s priesthood. Your leaders “feed” on your praise, and at the same time, would rather “kill” their brother than have them challenge their faulty, corrupt teachings. You and all JWs have been hoodwinked. Well you are having a good go at ithe hoodwinking, but actually you aren't having much success. Just lengthy diatribes of multicoloured text. 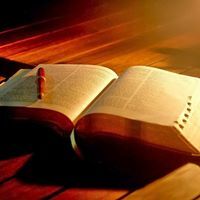 There are some scriptures there, the only relevant sections actually, but what lies in between is just a set of bitter sounding words without meaning or substance. Jesus said "his sheep will by no means follow a stranger but will flee from him because they do not know the voice of strangers" John 10:5. I'm sorry to say, yours is a very strange voice. 7 Therefore Jesus said again, “Very truly I tell you, I am the gate for the sheep. 8 All who have come before me are thieves and robbers, but the sheep have not listened to them. 9 I am the gate; whoever enters through me will be saved. They will come in and go out, and find pasture. 10 The thief comes only to steal and kill and destroy; I have come that they may have life, and have it to the full." This leaves out another path to salvation as the organization claims. I wish this wasn't so hard to see. No one can give spiritual credibility to an organization in Satan's world as the path to life. The Destroyer is Satan, who uses lies and deception to kill; to rob us of Truth in Christ. Ask yourself, is the organization's foundation on pure truth? JESUS is the only gate, not an organization. It is HIS voice that I and many others are now listening to, as the scriptures tell us to do. One effect of a disenfranchised anointed-in-the-wilderness model is that unity of Christians diminishes and ultimately dissolves. Christianity becomes little more than a personal code, molded differently in each individual by the greater forces of national, social, wealth, racial, educational divisions. Inevitably, Christians are at each other’s throats, each happy to do “what is right in his own eyes,” modified by a smileyGod face. Sometimes I think it is chosen for just that reason. It is the disunited world that Christians came out of. Why on earth would anyone want to go back into it? The point is, Witness, I haven’t seen any evidence that you actually DO anything, beyond crashing posts and reading half the Bible to those within. It is the disunited world that Christians came out of. Why on earth would anyone want to go back into it. You think I have fallen back into the world. The teachings of Christ have no part in the world. An earthly organization requires fleshly thinking, fleshly servitude and material money – signs of what the world offers and what the Watchtower puts to good use in every way possible. 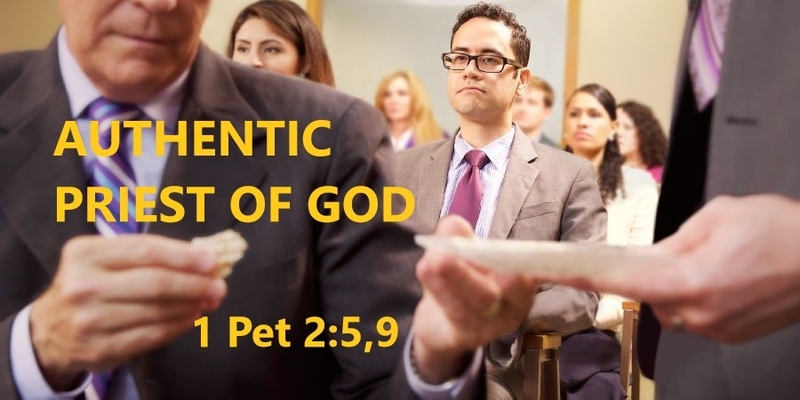 Which do you love more, God or the organization, or have their identities "blurred" together as your June Watchtower warned about when speaking about idolatry? They are so good at hypocrisy. One effect of a disenfranchised anointed-in-the-wilderness model is that unity of Christians diminishes and ultimately dissolves. The “wilderness” is where true Christianity in Christ is found. The pumped up glory of the organization far exceeds the JW knowledge of the glory of Christ, otherwise they would seek only him and the Father. Your eyes are filled with earthly things to admire and serve. Who really is it, that is part of the world, you or me? "what is right in his own eyes"
The Watchtower has replaced the smiley face with Caleb and Sophia. What did the early Watchtower call it? "Crafty promoters of religion"? Next thing you know, you will be asking some politician to sign your Bible. Or telling another one that he represents the political manifestation of God’s kingdom on earth. Next﻿ thing you know, you will be asking some politician to sign your Bible. It is simply what happens when ones go loner. They drift here. They drift there. They may stay solo or may end up in one of several polar opposite camps. The﻿ poi﻿nt is, Witness, I haven’t seen any evidence that you actually DO anything, beyond crashing posts and reading half the Bible to those with﻿in. Oh yes, I saw the news clip yesterday. I mentioned this to my husband and relayed the past bible signing event by the GB. That was believed, and sought after by JWs. Statements such as this one have created a captivity to falsehoods. If we love scriptural truth, we are drawn to it; and if it means reading half the Bible to find it and understand it, we do it. Christ's voice and those who preached "the way", was "strange" also. Now now, at John 10:5 Jesus wasn't talking about his voice being "strange". He was talking about those such as yourself who concoct all sorts of strange notions with scriptures thrown in for good measure. Your interpretations voice very strangely alongside the words of the "Fine Shepherd". But not to fear, his sheep listen to his voice, and because they know his voice, they follow him, certainly not you. Indeed, "because broad is the gate and spacious is the road leading off into destruction, and many are going in through it; Matt 7:13. Do I care to worship with people who don’t recognize the true Temple of God? Who admire the “work of their hands” over God’s own House? Who expect God’s “special possession” to bow down to a “Gentile” elder body? Who disfellowship victims of child abuse because they make a noise? Who disfellowship anyone who reject lies? Who fight tooth and nail in courts of law to uphold their own corrupt doctrine? Who side with the nations for aid when they are being persecuted? They are so desperate. Who are so “ignorant” of God that they believe that He looks the other way when false prophets and their predictions never come true? And of all stupid things…who get away with admiring an idol from the nations, by placing it in their own Idol/house of their god? The “law will go out from Zion”, the gathered, redeemed people of God; a remnant who have rejected “bad association” and praise only one God and His Son. Isa chapter 2. Notice what it says at the end of this chapter? This is what Revelation 18:4-8 is speaking about. “Get out of her, “my people”. 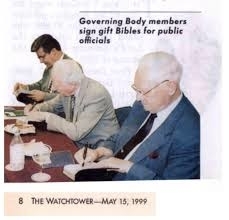 That cracked me up ... with snarky criticism of alluding to recent (past few days) national news that Trump signed Bibles for various clergymen (which was heavily criticized in the "fake media" by those with severe TDS ) ... and then seeing the posting of the Governing Body of Jehovah's Witnesses signing Bibles for politicians. I had seen that before, but I had completely forgotten about it. Thanks TTH .... always good for some "reducto ad absurdum" humor at the oddest times. Watchtower's Spiritual "Israel", Spiritual "Edom"
However, when it was time for Isaac to bestow blessings on his sons, Esau still expected to receive the birthright of the older son. Gen 27:36 Hello guest! Please register or sign in (it's free) to view the hidden content. I have a young 7-year old grandson that can be quite headstrong. If he refuses to complete a task asked jointly of both grandsons, it is held out to him that he will lose any reward that follows. When the task is accomplished, and the reward offered to the other grandson, the seven-year-old immediately balks and states the verdict is “not fair”, many times through tears shed over his loss of reward. When someone in a family shows an unreasonable stubborn streak, it is not uncommon to begin searching through the characteristics of older family members and blame it on that “gene”. The nation of Edom was Esau’s progeny. Edom harbored the animosity “gene” against Israel throughout Bible history. Jacob’s name was changed to Israel, letting us see that the Bible’s later references to “Jacob”, refers to the nation of Israel. Gen 36:1; 27:41 Hello guest! Please register or sign in (it's free) to view the hidden content. Isaac prayed to the Lord on behalf of his wife, because she was childless. The Lord answered his prayer, and his wife Rebekah became pregnant. 22 The babies jostled each other within her, and she said, “Why is this happening to me?” So she went to inquire of the Lord. 38 Esau said to his father, “Do you have only one blessing, my father? Bless me too, my father!” And Esau wept loudly. you will break his yoke from your neck. Gen 27:38-40. Edom (meaning red) was both a rugged, mountainous region and the location of Mount Seir, as well as desert and red sandstone cliffs where available pasture and land for farming practices was scarce. They imposed taxation on an ancient caravan route, as well as using sea trade routes as a source of livelihood. Although Esau and Jacob met amicably when Jacob was returning to Canaan with Rachel and Leah (Gen 33:1-4), several moments in Biblical history show us Edom’s bitter animosity toward Israel. Edom’s king denied Israel passage through their country in Num 20:14-21; 21:4; Deut 2:4-6. However, at that time, God set the standard that Israel was not to hate or despise their “brother”. Deut 23:7; Deut 2:2-6 Hello guest! Please register or sign in (it's free) to view the hidden content. Edom came against Israel during King Saul’s reign and was defeated. 1 Sam 14:47 King David “struck down eighteen thousand Edomites in “Salt Valley”, making the survivors subject to David’s rule. 2 Sam 8:13,14 The revolts continued down to the time of Nebuchadnezzar. Hello guest! Please register or sign in (it's free) to view the hidden content. As a result of conflict forcing the Edomites out of their own land, (in Greek, “Idumaea”) they fled into Judah close to the time period when Babylon under Nebuchadnezzar, plundered Jerusalem and destroyed its temple. Jer 25:3-12 Judah had gravely strayed from obeying God’s voice and commandments and was suffering the consequences. The Edomites assisted Babylon’s attack on God’s people, as well as overtaking cities and land once the Judeans were sent into exile in Babylon. Here, we find a fulfillment of Isaac’s words: “But when you rebel, you will break his yoke from your neck”. Hello guest! Please register or sign in (it's free) to view the hidden content. Three prophetic books speak of this event, condemning Edom and promising its destruction: Isa 34:5-8; Jer 49:7-22; Obad 1:10-15 Hello guest! Please register or sign in (it's free) to view the hidden content. Another conqueror came against the Edomites, forcing them to make a choice; either leave the cities conquered or convert to Judaism. The grandfather of Herod the Great, who built the last temple in Jerusalem, was among those who converted. Eventually, the mention of the people of Edom phased out of historical records around 70 c.e. As was the converted “Jew”, Herod the Great, many Edomites allied with Rome, even becoming Roman citizens. Others took part in the Zealot wars against Roman rule in Jerusalem. They had lost their established role as the nation of Edom or “Idumaea”, and had become “still”, unnoticed, as one of the root meanings within their name, signifies. To this day, it is not uncommon for Edomites who converted to Judaism, to be referred to as “false Jews”. Recent archeological evidence has found what appears to be temple remains in Idumaea. Along with a few other gods, the Edomites worshiped an ancient god considered a competitor to YHWH; called, “Qaus”. With the help and derivation of other linked Hebrew words, it may refer to such descriptive terms as bow, cast out as an arrow, ‘gleamed forth’, lighting, colors, mightiness, and interestingly, even briers. Historical records by Josephus show evidence of a priesthood as well. Today, we have a spiritual nation of God, called “Israel”. They are the priests and kings of Isa 43:10; 1 Pet 2:5,9,10; Rev 5:9,10; 7:4; 21:24 Hello guest! Please register or sign in (it's free) to view the hidden content. Pearl Doxsey explains this nation in her article, “TWELVE TRIBES”. She describes how the “little flock’ of physical Jews and the “other sheep” of physical Gentiles combine to become one anointed flock of spiritual Israel under the New Covenant. Heb 8:7; Hello guest! Please register or sign in (it's free) to view the hidden content. ; Rom 2:28,29; Hello guest! Please register or sign in (it's free) to view the hidden content. , Hello guest! Please register or sign in (it's free) to view the hidden content. Take note of her words, JWs! to take away the distinction between what God has cleansed (circumcision of the chosen Priest's heart by spirit) and the common spiritual Gentile. This deceptive doctrine is the basis for allowing the disgusting thing to enter the holy place (the MAN OF LAWLESSNESS to raise himself up above the sons of God). ( Hello guest! Please register or sign in (it's free) to view the hidden content. ; Hello guest! Please register or sign in (it's free) to view the hidden content. ; Hello guest! Please register or sign in (it's free) to view the hidden content. )" The governing body is not only a “root of bitterness”, (Rev 8:11) but are spiritual Harlots defiling all who buy into the belief that the idol/temple, “Jehovah’s organization” is the source of salvation. Each anointed one under its wing are the “foolish virgins” captivated and oppressed by the Harlot’s priesthood, the elder body/Beast. As long as they are accepting of the Harlot’s wares, they too fall under the “mother” covenant of death, Babylon the Great. Matt 25:8-13; Rev 13:7,17 Hello guest! Please register or sign in (it's free) to view the hidden content. 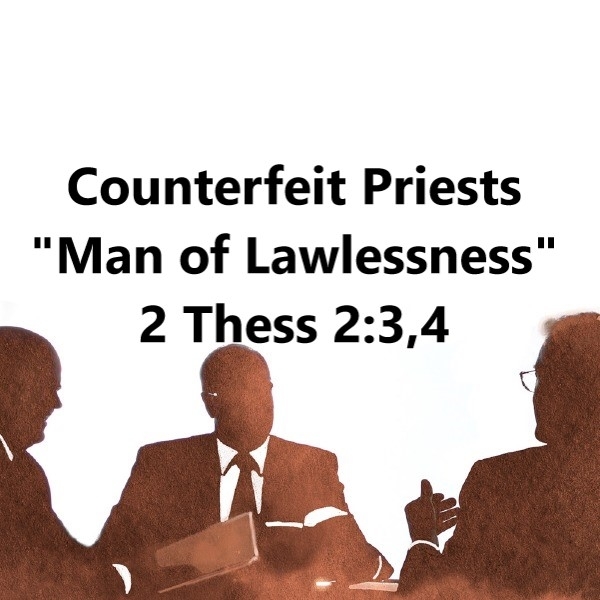 The Man of Lawlessness is this priesthood, and the false “Jews” and “briers” ruling over the true Temple dwelling of God, within the hearts of the anointed ones. 2 Thess 2:3,4; 1 Cor 3:16,17; Rev 9:1-6;11:1-3 The Body of Elders presently assists “Babylon’s” kings/false prophets in captivating spiritual “Israel” with, “blasphemies against God: TO BLASPHEME HIS NAME AND HIS DWELLING —those who dwell in heaven.” Rev 13:6 Hello guest! Please register or sign in (it's free) to view the hidden content. This priesthood/elder body has been given the authority to judge and “kill” God’s spiritual “Israel”. (Gen 27:41) We have a repeat of Ps 137:7. The anointed living “stones” of God’s Temple are effectively facing a threatening destruction under the Man of Lawlessness. Hello guest! Please register or sign in (it's free) to view the hidden content. In the same nature as the Edomite god, Quas, the Watchtower god uses deceitful, powerful displays as if originating from the true God, YHWH. OR, do you think that Satan is empowering the "TWO-horned" false prophet (counterfeit "two witnesses") with the ability to render a false CONDEMNATION OF THE RIGHTEOUS? (Rev.11:7-10; 13:15; 6:9,10,11) Hello guest! Please register or sign in (it's free) to view the hidden content. This "fire" comes "from heaven", because the point at which the false prophet receives this power; Satan has not yet been completely removed, and is still "waging war" with the "woman's" seed (Rev.12:3,4,8,13,17). He is not cast down (loses his heavenly authority) until this counterfeit fire is fully used against those righteous ones "killed" by it (Rev.11:7; 6:9,11; John 16:2; Mark 8:35), by which faithful deaths and testimony, he is cast down (Rev.12:10,11; 13:13,15,4)." Hello guest! Please register or sign in (it's free) to view the hidden content. So as is clear, yes, "fire from heaven" can be falsified, when it condemns the righteous to "death" (Eze.13:19; Jer.23:17,14; Rev.11:8). This is what the false prophet is enabled to do (Rev.9:1; 13:13,15; 6:9,10,11; 11:7-10) by means of Satan's ability (Job 1:12,16; Rev.13:2; 11:7; 9:11,1) to falsely condemn the righteous, causing counterfeit, symbolic "fire from heaven". Hello guest! Please register or sign in (it's free) to view the hidden content. JWs, the Watchtower is a hateful act of rebellion against “Israel”. All within, have fallen for this great end time deception of Satan’s. 2 Thess 2:9-12 Soon, the Man of Lawlessness will also turn on “Israel’s” Harlot/false prophet, stripping her bare and exposing her sins that even they can’t tolerate. A combined alliance of sell-out anointed “kings” and non-anointed elders will receive authority over all of unrepentant “Israel” and those with them, “for one hour.” Rev.17:7,12,13,16,17; Gen.25:30-33 Hello guest! Please register or sign in (it's free) to view the hidden content. FLEE now! Join those of “Jacob” who have left “Babylon’s” confusion; who are repentant and eager to serve the one true God and His Son, Jesus Christ. Deut 28:20; Jer 51:6; Zech 8:22,23; Matt 24:16; Rev 18:4-8 Hello guest! Please register or sign in (it's free) to view the hidden content. JWs, if you choose to listen to the linked chapter in Lamentation below, which is Jeremiah’s mournful dirge over Judah’s captivity, consider how you are admonished to respect the authority of, obey, and praise the elder body. At the same time, you are taught to scrutinize the validity of the anointed ones. Remember that the anointed Temple “stones”/ priests and “kings of the earth” are counseled by your governing body, and enforced by your elders, not to seek each other out, or gather together to study the Bible; as it THREATENS the unity and worship to be given to your god, the organization. Prov 6:16-19; Ezek 44:23 This is “trampling”, oppression and captivity. Rev.12:4; 9:10,19; 11:2; 13:7,10; Matt 26:52; (Gen 27:40) Your “Edom” is a spiritual desert as a result; fulfilling the promised blessing given to Esau by Isaac. Jer 14:15; Lam 5:10; Amos 8:11;Rev 18:8 Hello guest! Please register or sign in (it's free) to view the hidden content. The inherited promise bestowed on a faithful “Israel”, cleansed of all defilement, is fulfilled when the Kingdom of God arrives. Rev 6:9-11; Isa 61:7 Hello guest! Please register or sign in (it's free) to view the hidden content. Lamentations 1 - Hello guest! Please register or sign in (it's free) to view the hidden content. "Discerning the Ten Virgins/Called, Chosen and Faithful"